zenon provides unique graphic possibilities for HMI/SCADA projects. You can thus raise the usability of the completed application to a level that was previously unheard of. The result for the user is short training times thanks to intuitive operation, optimum reaction times and the highest possible level of security when in operation. This is how users unlock their potential and then that of the machines and equipment. zenon offers numerous functions that make operation of projects easier using touch screens and membrane keyboards. Hotkeys, tab keys, cursor keys, several freely-definable keyboard screens or a soft keyboard are used for navigation. The right mouse button can be simulated for touch operation. Context menus can thereby be used for touch screen operations. 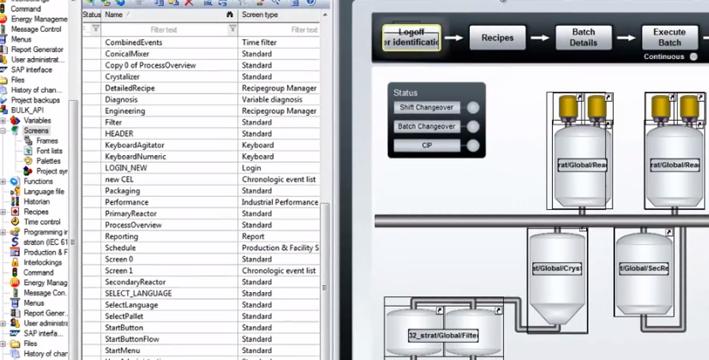 Functions such as the lasso function and drag & drop are optimized and also increase the usability of zenon projects. zenon is the first HMI/SCADA system in the world to offer full support for Multi-Touch gestures. New, innovative methods of operation can therefore be implemented. Users benefit from perfect usability and operational security. You can find more information on the Multi-Touch fact sheet #25. With zenon World View, process screens are displayed that cannot be displayed as a full screen on the monitor. Zooming, jump objects and different sections can be used to navigate through this World View. zenon World Views support different degrees of detail in different zoom levels with decluttering. Touch, Multi-Touch or the mouse can be used to navigate in the zenon World View. Windows-compliant menus guarantee intuitive operation and allow you to design particularly user-friendly projects. zenon supports main menus and context menus. zenon menus also work with touch and Multi-Touch operation. zenon is the first HMI/SCADA system in the world to offer full support for DirectX 11.1. zenon therefore offers maximum performance and additional possibilities for using graphics. For example, the accentuation of screen elements using glow effects and softening the background when actions are carried out. In addition, the support of DirectX 11.1 reduces the load on the CPU, because graphics calculations are outsourced to the GPU. The performance of the whole application increases. There are many pre-designed graphic display elements available in zenon. This allows you to implement various display and representation forms with only a few mouse clicks. Dynamic elements: These show variable values as display elements (numerical value, indicating instrument, etc.) or as dynamic effects (e.g. color changes of freely-definable elements). Dynamization using the properties of the elements: Dynamizations dependent on variable values can be set at the elements directly (position, size, color change). Automatic Line Coloring for the process engineering (ALC). Exemplary display of lines or pipes and their status. WPF elements allow separation into graphical design and functional configuration. The engineer can simply use elements created by graphic artists in external programs using XAML in the zenon Editor. Then they only need to be linked to the desired function and are ready for use. This way, usability and design can be improved optimally with no additional programming work in the zenon Editor.